This is the Classic Arabic Salad that you can find in every Arabic restaurant. It is easy to prepare, rich on vegetables and has a tasty dressing. 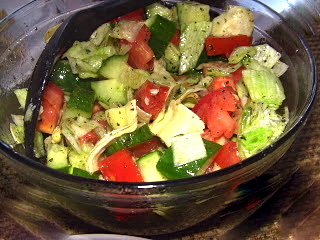 Cut the tomato, the cucumber and the lettuce into small one inch squares, and place them in a salad bowl. Add the artichoke hearts to the bowl. Add the Olive oil, the salt, the mint and the lemon to the bowl and mix. Now you are ready to have a unique and delicious salad. This entry was posted in Salad and tagged Arabic, Gluten Free, Salad. Bookmark the permalink.